The train is another popular but slower option. 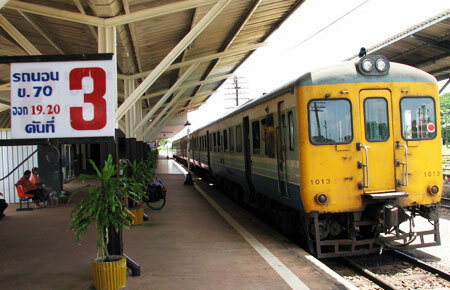 Trains depart Bangkok Hualampong station 3 times per day and twice a day from Ban Sue. Prices start at 150bt for standard 3rd class, 350bt+ for second class air-con, 600bt+ for air-con sleeper or 1,000bt+ for 1st class sleeper. Udon Thani will soon be linked up to Vientiane (Laos) by rail. Train schedules will be posted here when we have more information. The Bus is another alternative and is more regular that the train, buses depart Bangkok's northern bus terminal almost every hour but beware of the holiday seasons when you may find yourself unable to get a seat. Bus prices range from 250bt to 450bt. You can also hire a taxi driver to take you to Udon, just ask the local taxi drivers for a price. Expect to pay up to 6,000 baht one way. Or you can hire a car from Bangkok if you fancy doing the driving yourself. The governments of Thailand and Lao PDR concluded an agreement in March 2004 to jointly inaugurate a Thai-Lao International Bus Service in April 2004 to facilitate travel between Nong Khai & Vientiane and Udon Thani & Vientiane and promote cross-border travel and tourism between Thailand and Lao PDR. The routes will operate from the Thai province of Nong Khai to the Lao PDR capital of Vientiane , and from the Thai province of Udon Thani to Vientiane . Both will go across the Thai-Lao Friendship Bridge , the first to be opened across the Mekong River in 1994. The Nong Khai - Vientiane route is about 30 kms and will be covered in 30 minutes. The Udon Thani - Vientiane route is about 80 kms and will be covered in a little more than an hour, excluding the time that will be spent at the border crossing. One-way fares for the two routes are 30 baht and 80 baht respectively. The state-owned transport companies of Thailand and Lao PDR will each operate two round-trip services a day on both routes. Thailand 's Transport Company Limited will operate 45-seat air-conditioned buses. Foreign visitors holding valid visas and travel documentation will be able to travel by public transport buses back and forth across the border. While visa-free and visa-on-arrival facilities are accorded by both Thailand and Lao PDR to citizens of various nationalities, getting the necessary visas in advance will save considerable time and effort in doing paperwork at the border checkpoint. Individuals of Thai nationality will be able to apply for a 3-day/2-night Temporary Border Pass valid for a travel within Vientianne, while Thai residents of Nong Khai province will be able to apply for an Annual Border Pass. Application forms are available from the Nong Khai Provincial Administration Centre (Sala Klang Changwat) open daily from 06.30 - 16.30 hours. Applicants are required to submit the completed application form together with a signed copy of a valid identification card and 2 two-inch photographs. Applicants applying for the Annual Border Pass are also requested to submit a signed copy of their house registration documents in addition to the above. Applicants of Thai nationality with children between the ages of 12-15 are required to attach a signed copy of the household registration or birth certificate together with the application form.